What is the difference between a QT cartridge and an FX cartridge? QT Makes Changing Filters Quick, Easy & Sanitary! In-store staff can easily change filter cartridges. No need to empty water from a sump or clean and sanitize before replacing the filter. OptiPure Multi-Point systems use all QT cartridges from beginning to end! Filter replacement is quick and simple. Turn off the water, a quarter-turn to the left, pull down and remove the cartridge. Line up the insert arrows, push the new cartridge into the filter head, a quarter-turn to the right and the filter is replaced. It’s that simple. 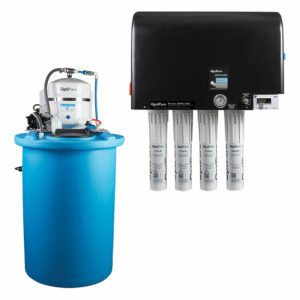 FX Water Filter Systems offer Exceptional Performance and Great Value! Replacement cartridge cost-per-gallon is much less than with quick-change filters. Generates less waste than metal or plastic quick-change filters. Only the drop-in media is discarded — more environmentally-friendly choice. Based on performance, system cost is typically less than quick-change style systems. Lower cost replacement cartridges compared to the quick-change cartridges. What do the Letters and Numbers Mean on OptiPure Products? Click here for the Glossary of OptiPure abbreviations to help explain. IAPMO Research and Testing (IAPMO R&T) is an ANSI-accredited certification body that offers approved product certification to manufacturers in the foodservice industry. 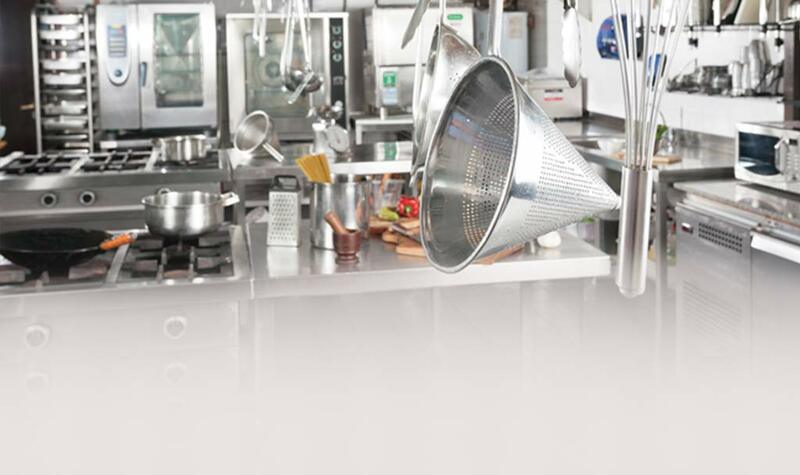 IAPMO’s Water Systems Certification Program informs and instills the utmost confidence in restaurants, regulators, inspectors, manufacturers and the public that the water filtration products have been tested and certified to the applicable NSF standards. IAPMO marks of conformity are widely recognized, readily accepted by local health agencies across the globe and represent the highest degree of integrity in showing compliance with established codes and standards. Can OptiPure help test my water? 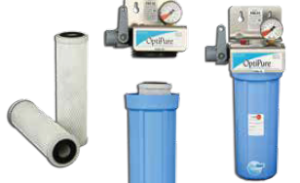 OptiPure offers two products to help test your water, H2OTest Express Kit (part # 180-80180) and a more extensive test, Watercheck-OP Water Test (part # 180-81105). Contact your local OptiPure dealer, distributor or representative to order. 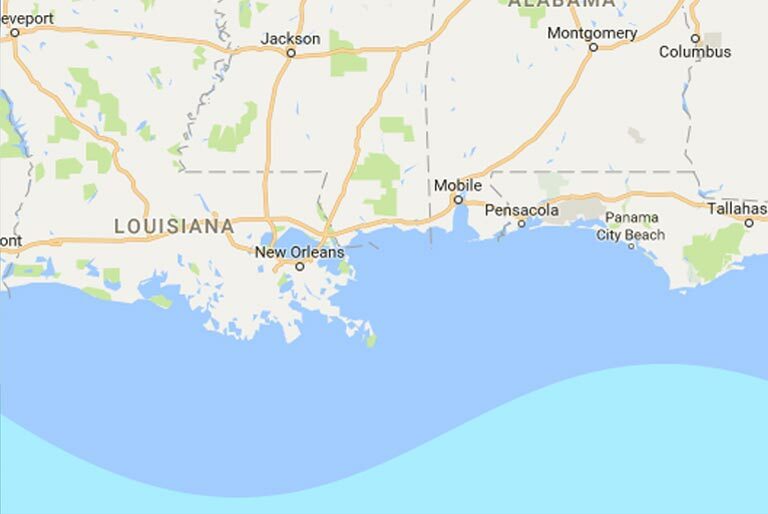 How should I prepare for bad weather, such as hurricanes? Download our suggested preparations for bad weather here. 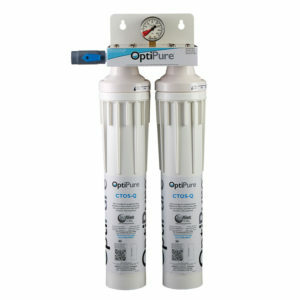 How much water do the OptiPure reverse osmosis systems waste? 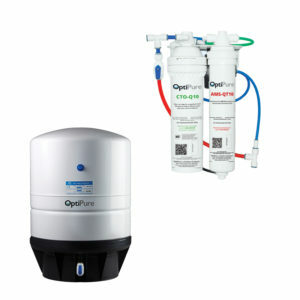 OptiPure OP or BWS reverse osmosis systems do not “waste” any water! They have a reject stream going to the drain that is required to wash away contaminants removed by the membrane. This is the cost of producing optimized water for your application and is the most cost-effective and reliable method to remove Total Dissolved Solids (TDS) such as chlorides, sodium, calcium and sulfates from ingredient water. With many of the OP and BWS systems, the amount of water “rejected” can be adjusted to maximize efficiency. Should I put scale inhibitor filters that use polyphosphate on water feeding the soda fountain? 1) Polyphosphate scale inhibitors will interfere with fountain beverage quality. 2) Soda fountains do not suffer from lime-scale problems due to the added carbon dioxide that increases the solubility of calcium carbonate in the water, preventing it from forming scale. Will a carbon filter reduce chlorides, sulfates or calcium? No, activated carbon filters do not reduce Total Dissolved Solids (TDS) such as chlorides, sodium, calcium and sulfates. Carbon filters are extremely effective at reducing chlorine, improving taste and reducing odor. What is the best water filter for an ice machine? 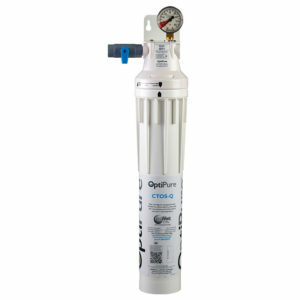 In most cases, the OptiPure QTI or FXI series water filter systems with the patented IsoNet scale inhibiting technology will provide the best protection. 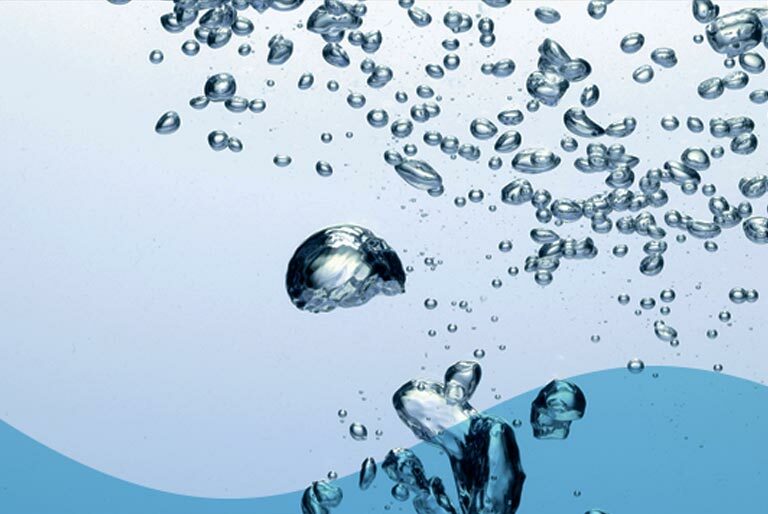 However, if you have very high Total Dissolved Solids (TDS) or high sodium, chlorides or sulfates, it might be desirable to go with our OP or BWS Reverse Osmosis (RO) systems to lower the TDS, providing a very high-quality ice. If you notice that your ice is soft and melts quickly, then it is likely due to high TDS. An OP or BWS RO system may be the best solution to provide you with a solid, long-lasting ice cube. What is the best water filter for my soda fountain? 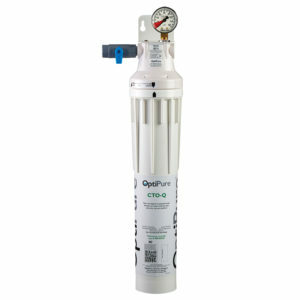 If your water utility is using chloramines, then use the OptiPure Models QT1+CR, FX-22CR, FX-22BCMR, or FX-22PCR+. If chloramines are not present, utilize any of the QT beverage systems that meet the needed flow and capacity requirements. Do you still have questions? Head on over to our Where to Buy section and give one a distributor a shout. Most of them should be able to help you. 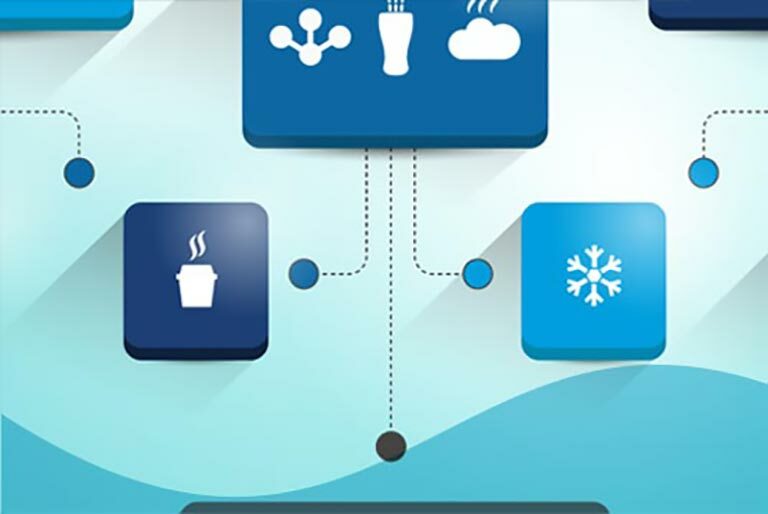 Should I put a water softener on my ice machine? Water softeners on ice machines should be avoided in most cases. Excess sodium in water has the ability to alter the freezing and melting temperatures of water. Thus, water softeners will lead to soft, mushy ice cubes that melt faster and can negatively impact beverage quality. What is the best water filter for an espresso machine? In most cases, systems that utilize Reverse Osmosis (RO) with mineral addition and/or blending will provide water with ideal characteristics for the best coffee beverages and protect your equipment from lime-scale build-up, or corrosion, preventing costly service calls. It is never recommended to utilize polyphosphate (softening)-filters on your espresso machine, as this chemical will collect in the boiler and lead to additional service calls for your machine. How do I measure the Total Dissolved Solids (TDS) in water? Total dissolved solids, or TDS, is measured using an electronic meter similar to a conductivity meter that measures the conductance of the water caused by the dissolved solids and converts it to a part-per-million (ppm) reading. 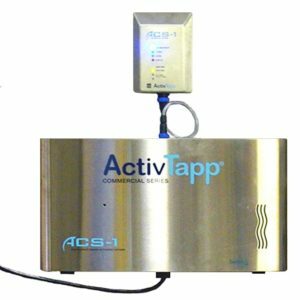 A conductivity meter will not measure a number of contaminants in the water that do not conduct electricity, nor will it provide an accurate measurement or indication of the amount of chlorine or chloramines in the water. What is chloramine and how do I know if my water has been treated with it? Chloramines are an alternative disinfectant to chlorine. Specifically, chloramines are a blend of chlorine and ammonia that has been shown to greatly reduce the disinfection by-products caused by chlorination. There are different forms of chloramine: mono-chloramine, di-chloramine, trichloramine and organic chloramines. The city water treatment plant uses only mono-chloramine. We recommend asking your local water utility if they use chloramine in the water or have your water tested. For more information on chloramine, go to the EPA website. What is the best way to remove chlorides from my water? 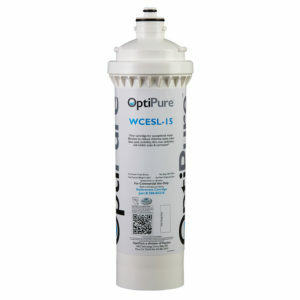 The best method for removing chlorides from water reliably and economically is using a reverse osmosis system like we utilize in our OptiPure OP and BWS Systems. What is the Standard Warranty for OptiPure Products? All system components and assembly except for replacement filter cartridges, separation membranes and permeate pumps, electric motors, diaphragm pumps, and rotary vane pumps shall be warranted against defects in workmanship for a period of 60 months from the date of original shipment. Replacement filter cartridges are warranted for defects in material and workmanship only. Service life of replacement filter cartridges varies significantly with local water conditions and volume and thus cannot be warranted. Furthermore, separation membranes are equally susceptible to feed water conditions (e.g. presence of iron, alum and silica) and shall be warranted only for defects in construction. Membrane failure due to fouling, hydrolysis, oxidation or other damage caused by the local water conditions is not covered under warranty. Permeate pumps, electric motors, diaphragm pumps, and rotary vane pumps shall be warranted against materials and workmanship for a period of 12 months from the date of purchase and are limited to the terms of warranty extended by the original equipment manufacturer. Products should only be installed and operated in accordance with the Company’s recommended procedures and guidelines. 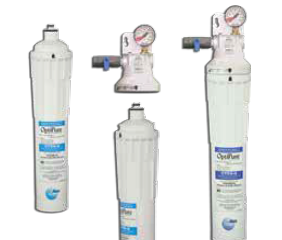 Products must be maintained and serviced with OptiPure approved replacement parts and filters. Failure to replace filter cartridges or filter elements at the recommended interval or specified capacity will void warranty. In the event of such defects occurring within the warranty period, the Company will, at its option, replace or recondition the defective component without charge. Warranty-related repairs are to be affected by returning the product to the Company, freight prepaid, with the proper “Returned Goods Authorization” number, for repair. This shall constitute the exclusive remedy for breach of warranty, and the Company shall not be responsible for any incidental or consequential damages, including, without limitation, damages or other costs resulting from labor charges, delays, vandalism, negligence, fouling caused by foreign material, damage from adverse water conditions, water hammer, chemicals or any other circumstances over which the Company has no control. This warranty shall be invalidated by any abuse, misuse, misapplication, alteration or improper installation of the product. 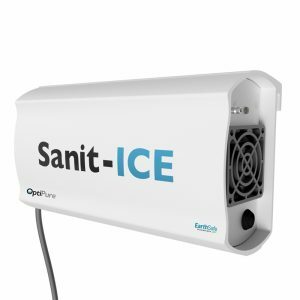 1) Contact your authorized OptiPure dealer who supplied the product. 2) Or call the Company’s customer service department for replacement parts and support. Replacement parts for defective parts covered under the terms of the warranty will be shipped the same day via overnight service at the Company’s expense. Upon return of the defective parts, a credit will be issued for the replacement parts if found to be covered under the warranty. If defective parts are not covered under the warranty and found to be defective by causes outside of the Company’s control, the customer will be responsible for overnight freight charges. The Company will furnish factory labor to make repairs on parts or products that are covered by the warranty and returned to the factory. In no case will the Company be liable for the cost of field labor for repairs. The Company will pay normal surface shipping charges to return to the customer parts or products covered under terms of the warranty. In the case of the customer contracting with a local third party to install or replace parts covered under warranty, the Company will not be responsible for the charges incurred or any additional damage done to the product (e.g. cross-threading, over-tightening, or over-application of Teflon tape or stripping of pipe threads). This warranty is in lieu of all other warranties, expressed or implied, including warranties of fitness for a particular purpose. This is the exclusive remedy. Liability for consequential damages, under any and all warranties, are excluded to the extent exclusion is permitted by law. What are OptiPure’s Standard Terms and Conditions of Sale? OptiPure’s standard terms and conditions may be found via this link.